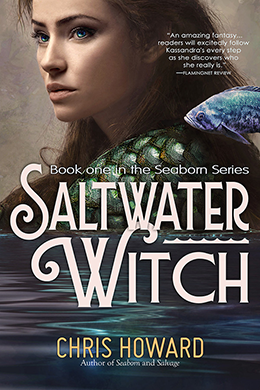 Chris Howard's Writing & Art: Saltwater Witch Giveaway at GoodReads! SaltwaterWitch.com Poster 2012 Kassandra with her scale armor coming apart and floating away. I worked on this last night, finished up the type for some prints over lunch today. It's actually a good sized piece, about 26 inches tall. Check out the full-sized image, because it looks a bit fuzzy in the reduced size.